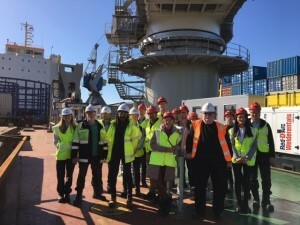 Following the success of our Cigre-UK NGN event to visit Boskalis’ Giant 7 cable barge in the Netherlands earlier this year, we are delighted to offer a second opportunity to visit a cable ship, this time kindly offered by Global Marine. You can read more about our last trip here. The upcoming visit is planned for Wednesday 27th March* in Portland, Dorset and will be limited to just 12 attendees. If you are interested in this visit please e-mail Stefie Cray by Friday 25th January and provide your name, organisation, Cigre membership type (and number), and a contact phone number. *Please note that the date is subject to change. This is a working ship and therefore it is possible for a late notice reschedule of timings. For this reason we will take a reserve list, and if the date changes and attendees are unavailable we will offer the places to our reserves. NGN members will be given preference, but any Cigre-UK member may express interest in being added to the reserve list.